SAN FRANCISCO -- San Francisco police Chief Greg Suhr Friday said the man fatally shot by police Wednesday as he stood with a shotgun on top of a building in the Mission District does not appear to have fired any shots prior to his death. The suspect, identified by the San Francisco medical examiner's office as 25-year-old San Jose resident Javier Lopez Garcia, was fatally shot by San Francisco police officers at the site of California Pacific Medical Center's St. Luke's campus at 3555 Cesar Chavez St., which is currently under construction. Speaking today at a town hall called to discuss the police shooting, Suhr said multiple eyewitnesses told homicide investigators at the construction site that Garcia was exclaiming as he walked through the site to the sixth floor that "he just wanted to die." Garcia advised the witnesses that they should call the police and alert the news media, Suhr said. Garcia wrote, "I need a 12 gauge marine finish tactical pump shotgun don't ask who what when where why the only difference between me and you is I'm not afraid to get shot." Suhr today said there were reports that Garcia had been shooting and officers heard what they believed to be gunshots as they arrived at the scene, but there were no spent casings from the shotgun found at the crime scene. "We don't know that he fired any shots," Suhr said today. The chief said that ever since the mass shooting at Columbine High School in Colorado in 1999, law enforcement around the United States and in San Francisco have trained "to engage an active threat to prevent further loss of life or serious injury in all active shooter situations. This was that situation." In the moments prior to his death, Garcia reportedly roamed through the construction site, where roughly 30 construction workers were trapped, while brandishing two firearms, according to Suhr. 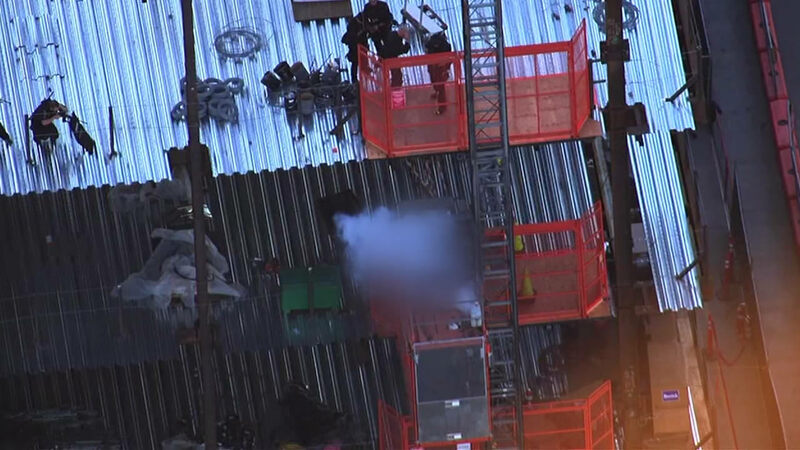 Officers located Garcia on top of a construction elevator armed with what was later determined to be a pistol-grip silver shotgun and the airsoft pistol. Garcia had the shotgun in a shooting position and was moving it from side to side, Suhr said. "Officers believed the suspect to be targeting civilians and police," according to Suhr. Suhr said officers repeatedly identified themselves and instructed Garcia to drop the firearms, but he didn't comply and continued to point the weapon at the hospital, police and civilians. Suhr said Garcia fled from San Bruno to San Francisco in a white GMC Sierra pickup truck, later located at the construction site. Suhr said investigators still don't know why Garcia chose to go to the construction site in San Francisco after leaving San Bruno. The San Francisco medical examiner's office is conducting an autopsy examination to determine Garcia's cause of death. Suhr said the Office of Citizen Complaint, the San Francisco District Attorney's Office and the San Bruno Police Department are also investigating the incident. Suhr acknowledged that the use of deadly force was a tragedy and said he has spoken to Garcia's mother and apologized for the loss of her son. He said he's glad, however, that no additional lives were lost.